Your child will build several bridges of different designs, including a suspension type, spanning 12 m! 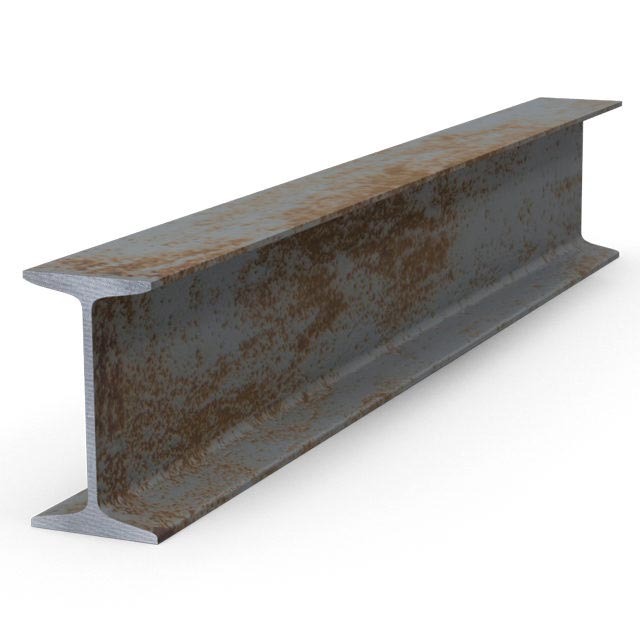 We start by introducing your child to engineering basics with a simple beam. 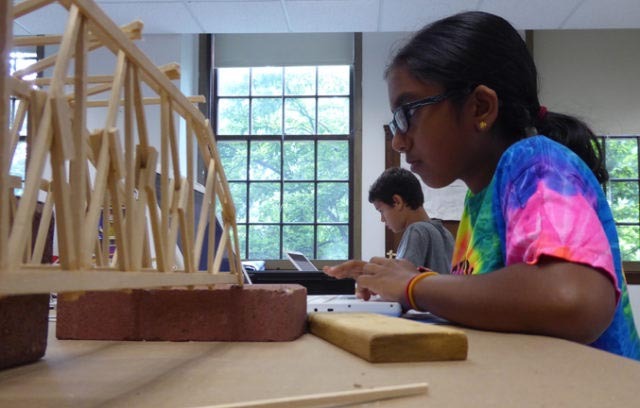 Then each child engineers, builds, and load tests an efficient model bridge that satisfies certain design criteria. Outside, we build three different bridges: a truss bridge, a suspension bridge, and an arch bridge. Inside, your child works with a design simulator that presents the design considerations addressed by bridge engineers. Engineering conduct and ethics are taught, and we draw on real-life engineering challenges through case studies and historical accounts. The week culminates in a mini engineering fair, where family and friends can see the model bridges tested under load. John is the owner & founder of Edge on Science and has a background in civil engineering. His concrete design instructor, Professor Mills, left a lasting impression in class one day, when he had his students stand up and imagine that they were concrete columns. John brings this immersive approach to this structural engineering program! Discover the flow of forces in an arch bridge, model timeless stone structures, and then unravel the genius of Leonardo da Vinci by examining one of his designs. Learn the different trade-offs between function, form and cost faced by real-world bridge designers every day. 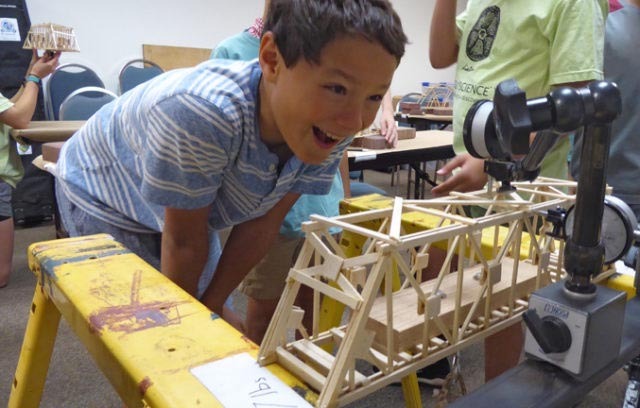 Explore the fascinating challenges of building a bridge that stays up under load, and build not one, but three large outdoor models with a team. What could be more fun? Campers always come home happy and excited! Why is EOS Bridge Building a good choice? If your child has made spaghetti bridges at school, then this program takes them to an entirely new level. We know that children easily relate to bridges. Here, they’ll have the experience of working in a team, staying safe, exercising quality control, supervising, building, using tools, measuring, reading drawings, communicating, estimating, and managing and organizing. We’ve learned that models are an effective way for kids to explore form and function in the engineering design process. 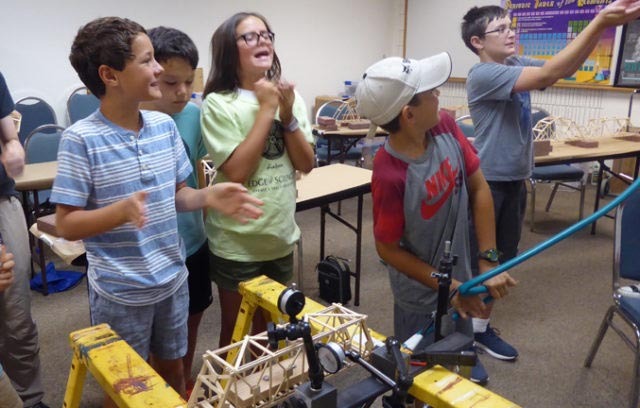 By grabbing hold of a large-scale model bridge, campers can gauge its stiffness and know firsthand how it will support a load. And imagine the excitement and satisfaction of unboxing crates of bridge components, and then assembling them into a working 8-meter suspension bridge! 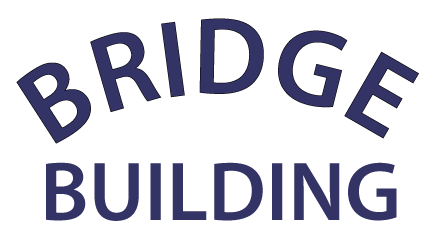 Bridge Building dates and locations …expected to sell out!